The Bluegrass Heritage Foundation is proud to announce that it has presented several instruments to young people in the North Texas area over the past few months through the Play It Forward!™ Instrument Lending Program. 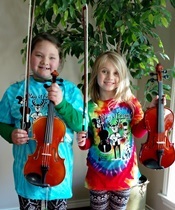 Audrey Fields, an 8-year-old from Waxahachie, is teaming up with her sister, 6-year-old Madelyn Fields, to learn to play fiddle on instruments provided by our program. 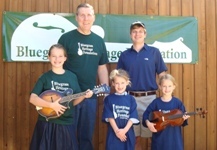 Their mother and father, Lori and Jason Fields, are members of our bluegrass community and are musicians as well, and they are excited that their daughters want to learn to play. Jacob Jander of Irving, Texas is anxious to develop his flatpicking skills using the vintage Alvarez acoustic guitar provided by our program. He said that he’s already learned most of the chords to his favorite bluegrass gospel tune, This World Is Not My Home, and he’s ready to learn more bluegrass tunes. And John Puetz of Dallas was excited to start learning to play bluegrass banjo on the Gretsch five-string banjo provided by the program in December. As always, we are thrilled to be able to help deserving young people who want to be a part of our bluegrass music community. We sincerely appreciate all of the Bluegrass Heritage Foundation supporters who make a difference and find a way to do good for so many fine young people. In October 2016, the Bluegrass Heritage Foundation, through the Play it Forward! 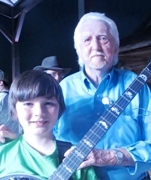 Instrument Lending Program®, presented 12-year-old Riley Gilbreath of Fort Worth, Texas, with a five string banjo so that he could start taking bluegrass banjo lessons. Riley made dramatic progress quickly, impressing his teacher Jim Penson and others who helped him along by exhibiting a dedication and drive to play shown by few others. At the Bloomin’ Bluegrass Festival & Chili Cook-Off held in the Farmers Branch, Texas Historical Park on October 21, 2017, Steve Huber of the Huber Banjo Company was on hand to perform with Texas & Tennessee. He also had a number of new Huber banjos on display. Steve enjoyed picking with Riley, and spent a great deal of time giving him pointers on how to play more proficiently. One thing led to another, and the decision was made by Alan Tompkins of the Bluegrass Heritage Foundation, Steve Huber, and Jana & Danny Gilbreath (Riley’s parents) to present Riley with a new professional-grade walnut Huber Workhorse banjo for his continued development. Riley is only the second person to be named a Youth Showcase Artist, with the first being Brandy Miller in 2012. The presentation was made to Riley on stage at the Festival, and Riley was moved nearly to tears. 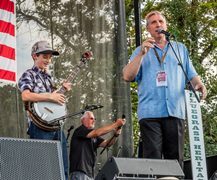 His father reported that Riley asked for days afterwards, “how can something this good be happening to me?” In the weeks since the presentation, Riley has played on stage several times as a guest with Dallas/Fort Worth area bluegrass bands. We expect that he will continue to have opportunities to perform on stage for years to come. 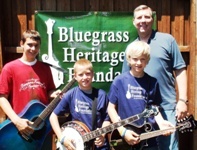 As always, the Bluegrass Heritage Foundation is thrilled to be able to help deserving young people play bluegrass music, and we sincerely appreciate all of our supporters for helping to make it happen. We’d especially like to thank the family of Johnny Lee Vincent, including Rhonda Vincent, Carolyn Vincent, and Darrin Vincent, for their support of the Foundation’s Play it Forward!® program and the Johnny Lee Vincent Memorial Scholarship Program. Their support helped to make these programs possible. Here’s a video of the presentation, courtesy of Mark Shaffer. Photos are courtesy of Nathaniel Dalzell. 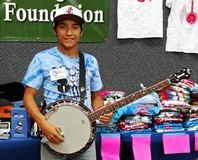 The Bluegrass Heritage Foundation has been busy in recent months presenting instruments to young people around the North Texas through our Play It Forward!™ Instrument Lending Program. The latest is 12-year-old Nicholas Williams of Howe, Texas (pictured at left), who is the younger brother of another Play It Forward!™ participant, Jacob Williams (at right). We are excited to help more young people learn and play bluegrass music, and we appreciate all who have supported the Foundation with donations and instruments to make this happen. 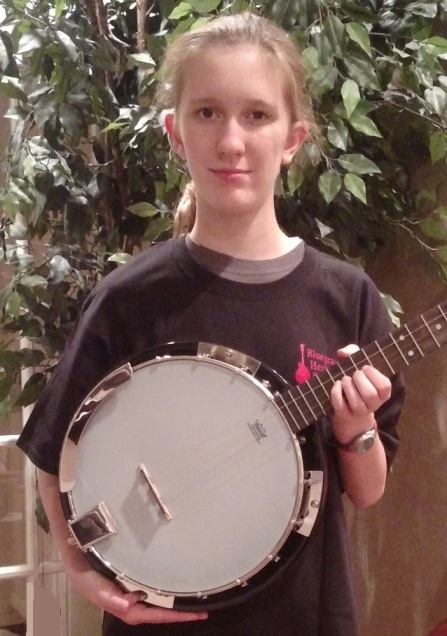 15-year-old Patience Newsom of Plano, Texas is excited to start learning to play bluegrass banjo. Patience joined us at the Wylie Jubilee on July 2, 2016 to pick up a great-sounding vintage Iida banjo. Nate Jennings, a talented 11-year-old ukulele player from Tyler, has received a banjo through our program so that he can learn to play with his guitar-picking big brother, Tom. 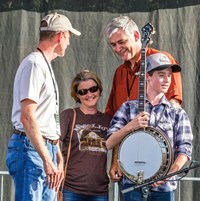 Dalton Bartlett, a 16-year-old from Anna, Texas, received a mandolin on stage at Lone Star Fest at the same time that 13-year-old Jacob Williams of Howe, Texas received his banjo. 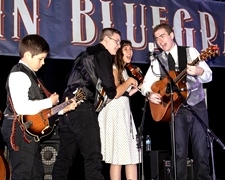 Dalton and Jacob were welcomed on stage by Blue Grass Boy Blake Williams, a former member of Bill Monroe’s band. And we have another Jacob Williams, a wonderful 9-year-old young man from Weatherford, Texas, who recently picked up a banjo from the Foundation, and he too is excitedly learning to play bluegrass banjo! 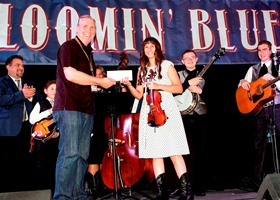 We’re thrilled that so many deserving young people now have the opportunity to join the bluegrass music community! Our thanks to all who support the Foundation and do good for these young people. 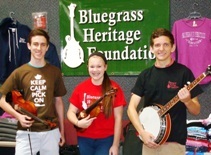 The Bluegrass Heritage Foundation has recently presented several instruments to young people in the North Texas area through the Play It Forward!™ Instrument Lending Program. 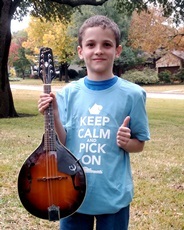 Caleb Woolverton, a 14-year-old from of Melissa, Texas is learning to play mandolin on a nice Savannah mandolin that was previously used by Brody Genzel of Anna, Texas. 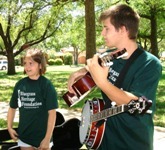 And Katie LaDue, a 13-year-old from Dallas (pictured at right), is learning to play banjo on a nice five-string Fender banjo provided by the Foundation. 12-year-old Hannah Briggs of Carrollton, Texas is now happily learning to play along with her 10-year-old brother, Joshua Briggs! (Hannah and Josh are pictured at left). Hannah is learning to play guitar and Joshua is learning banjo. The banjo in use by Joshua is a nice Fender donated by Foundation friend Stacy Jackson, who plays with Pearl & The Polka Dots. 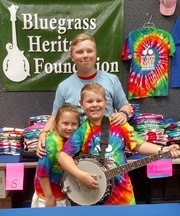 We’re thrilled that more young people have a chance to play and join the bluegrass music community! Our thanks to all who so generously support the Foundation and do good for these young people. 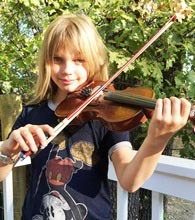 Nine-year-old fiddler Lylah Clark of Diamond Springs, California will attend the Walker Creek Music Camp at the beautiful Walker Creek Ranch in West Marin County, California, just north of San Francisco (October 8-11) under the Johnny Lee Vincent Memorial Scholarship Program from the Bluegrass Heritage Foundation. 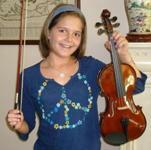 Lylah has been playing fiddle since she was seven years old and loves old-time and bluegrass music. She enjoys playing traditional acoustic music with her father (yes, his name is Joe Clark) and younger sisters in the Clark family band. The Walker Creek faculty will include our friends from the Special Consensus – Greg Cahill, Rick Faris, Dustin Benson, and Dan Eubanks – and many other widely-known players. The Johnny Lee Vincent Memorial Scholarship Program is named in memory of Mr. Johnny Vincent of Greentop, Missouri, a bluegrass pioneer and the father of the Bluegrass Heritage Foundation’s first Bluegrass Star Award recipient, Rhonda Vincent, and bluegrass star Darrin Vincent. Johnny and his family toured the world as the Sally Mountain Show, performing their special brand of bluegrass music. He was known for his unique banjo style and founded the Sally Mountain Bluegrass Festival in Queen City, Missouri. The Bluegrass Heritage Foundation sincerely appreciates the support of Mr. Vincent’s family and friends, our other donors and volunteers, and all who attend our events and make it possible for us to help deserving young people like Lylah Clark. 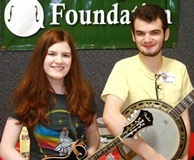 18-year-old banjoist Matt Laird and his guitar- and mandolin-playing sister, Rebecca Laird of Katy, Texas, attended the ninth annual Acoustic Music Camp in Arlington, Texas (August 6-8, 2015) under the Johnny Lee Vincent Memorial Scholarship Program from the Bluegrass Heritage Foundation. Matt was inspired to play banjo about four years ago by listening to Steve Martin’s banjo performances, and Rebecca has been studying guitar, mandolin, and banjo for a number of years. The Acoustic Music Camp faculty included Winfield-winning banjoist James McKinney along with other renowned musicians including Robert Bowlin, Tim May, Dix Bruce, Dave Hamburger, and Gerald Jones. The Bluegrass Heritage Foundation sincerely appreciates the support of Mr. Vincent’s family and friends, our other donors and volunteers, and all who attend our events and make it possible for us to help deserving young people like Rebecca and Matt Laird. 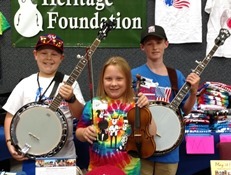 The Bluegrass Heritage Foundation has recently presented several instruments to young people in and around the North Texas area through the Play It Forward!™ Instrument Lending Program. Ben Woolverton (pictured) of Melissa, Texas is learning to play banjo on a Recording King RK-R20 five-string banjo provided by the Foundation. Eight-year-old Nate Pedersen of Dallas is working on his fiddling skills with a 1/2 size fiddle, and his 10-year-old brother Luke Pedersen is learning to play guitar on a Recording King RD06. 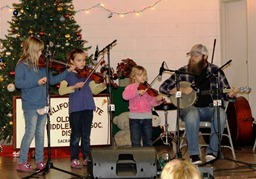 We are thrilled that more young people are getting the opportunity to learn and grow by playing bluegrass. We appreciate all who have so generously supported the Foundation so that more young people have the opportunity to learn to play. 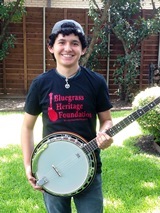 16-year-old Colby Green of Cosby, Tennessee will attend the 10th Annual Smoky Mountain Banjo Academy in Pigeon Forge (May 1-3, 2015) on the first-ever scholarship under the Johnny Lee Vincent Memorial Scholarship Program from the Bluegrass Heritage Foundation. Colby takes lessons from former Winfield champion Gary “Biscuit” Davis, and we hope that the SMBA experience will help him advance as a musician. The Smoky Mountain Banjo Academy faculty includes Kristin Scott-Benson of the Grascals, Jason Burleson of Blue Highway, and former Blue Grass Boy Butch Robins. The Bluegrass Heritage Foundation sincerely appreciates the support of Mr. Vincent’s family and friends, our other donors and volunteers, and all who attend our events and make it possible for us to help deserving young people like Colby Green. Bluegrass Heritage Foundation President Alan Tompkins presented Sarah Rodriguez of Richardson, Texas, with a Savannah F-style mandolin today as part of the Foundation’s Play It Forward!™ Instrument Lending Program. He also presented her brother, Mark Rodriguez, with a vintage fiddle and bow. Sarah has fiddle experience, has jammed with the Garland Square Pickers, and is looking forward to learning to play mandolin. Mark is looking forward to learning to play fiddle, and there is hope that one day he and his sister can start a family band with their siblings. 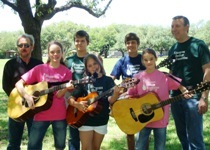 Longtime bluegrass musician Chris Erickson of Garland has been mentoring the Rodriguez family and plans to bring them out to the Garland Square to jam with other bluegrass musicians. Tompkins commented that “we are so happy to help the Rodriguez family along on their bluegrass musical journey.” Sarah is pictured here with her new mandolin and Mark’s fiddle. 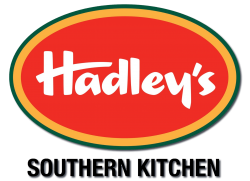 Hadley’s Southern Kitchen is the brainchild of founder Tom Hammond. 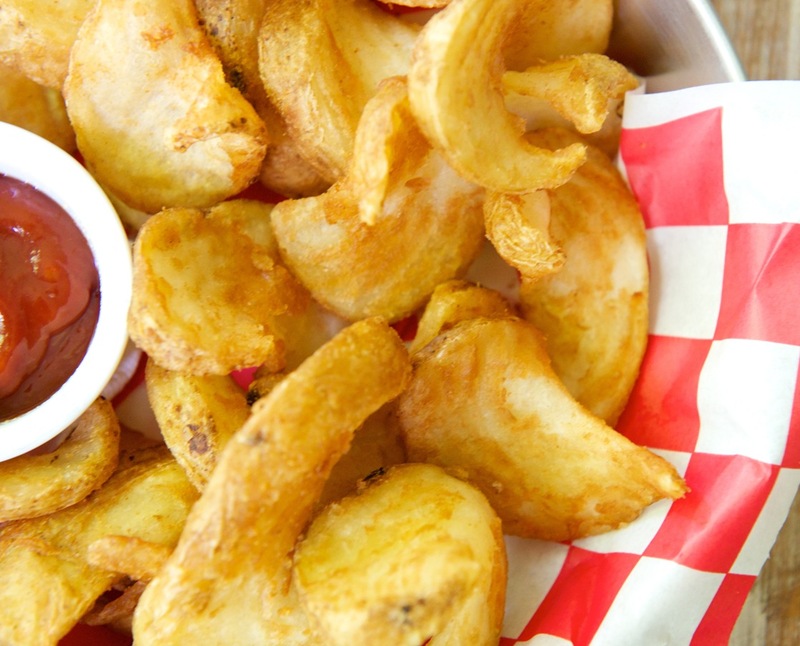 Having been born and raised in the south, Tom grew up eating southern comfort foods like cornbread, white beans, pork tenderloin, and fresh-baked pecan pies. Even as an adult traveling throughout the southern United States, Tom was drawn to local restaurants specializing in these southern foods. This heritage of diverse flavors, combined with the warm and friendly atmosphere the South is known for, made such an impression on Tom that he came up with an idea for a fast casual restaurant that would feature the best of both, where food still tastes like home. 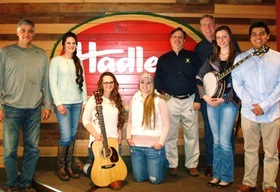 Many connected with the Foundation gathered at Hadley’s in February to pick, grin, and say THANK YOU to Mr. Hammond and the folks at Hadley’s for their generosity. Pictured at right are Steve Huber of Huber Banjos (a long-time Foundation supporter), Tori, Jocelyn, and Shelby Gold of the Virginia-based bluegrass band Gold Heart (which regularly plays Foundation events), Tom Hammond, Alan Tompkins, banjoist Brandy Miller (our Play It Forward!™ Youth Showcase Artist), and Lucas White (who was featured in Fanning the Fire). The next time you visit the Nashville area, please stop in at Hadley’s (at 4700 Lebanon Pike in Hermitage), enjoy a great meal, and let them know you appreciate their support of the Bluegrass Heritage Foundation. Bluegrass Heritage Foundation President Alan Tompkins presented William Roberts of Watauga, Texas, with a nice Stagg 5-string banjo as part of the Foundation’s Play It Forward!™ bluegrass music Instrument Lending Program. (The banjo was donated to the Foundation by long-time volunteer Mr. Paul Mattoon.) William had been learning to play bluegrass banjo, but had to borrow an instrument in order to take lessons. He is thrilled to have his own banjo so that he can pick, grin, and take lessons at any time the notion strikes! William plans to attend bluegrass music events such as the Bloomin’ Bluegrass Festival & Chili Cook-Off so that he can jam with others and learn more about the music. 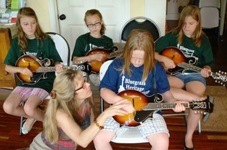 William is pictured here at Acoustic Music Camp. He received a Foundation scholarship to attend the camp in August 2014. 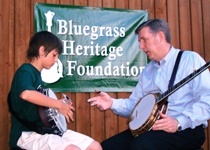 Part of the mission of the Bluegrass Heritage Foundation is to educate and encourage young people in bluegrass music. 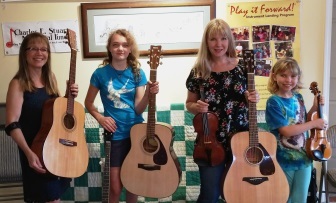 In addition to operating the Play It Forward!™ Instrument Lending Program, the Foundation teamed up with Acoustic Music Camp to offer scholarships so that some deserving young people could attend Acoustic Music Camp (August 7-9, 2014). The camp is held annually at South Oaks Baptist Church in Arlington, Texas. 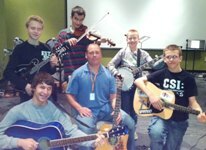 Acoustic Music Camp is a three-day instructional program for musicians with intensive expert instruction in how to play mandolin, bluegrass and clawhammer banjo, flatpick guitar, upright bass, fiddle, songwriting/vocals, dobro, and fingerstyle guitar. 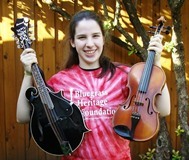 Fiddler Maddie Smith of Lewisville, fiddler Chad Bekarian of Dallas, and banjo player Williams Roberts of Watauga, Texas were awarded scholarships that helped them to attend Acoustic Music Camp 2014. All three young students were learning, picking, and grinning at the camp all three days! The Bluegrass Heritage Foundation appreciates the support of those who attend our events and make the donations that enable the Foundation to provide this assistance to fine young people like Maddie, Chad, and William. Bluegrass Heritage Foundation President Alan Tompkins presented Natasha Brandon of Dallas, Texas, with a Recording King RD-06 guitar today as part of the Foundation’s Play It Forward!™ bluegrass music Instrument Lending Program. Natasha has some musical training (she plays flute in her school orchestra), has already begun to learn guitar, and is excited about learning to play bluegrass music. Longtime bluegrass music fan and friend of the Foundation Kim Roulias knows Natasha well and has promised to give her weekly guitar lessons and to bring her out to bluegrass music events! 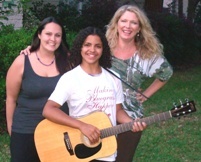 Tompkins commented that “as always, we are thrilled to be able to help another young person experience the joy of playing bluegrass music.” Natasha is pictured here with her mother, Jennifer Thompson, and Kim Roulias. 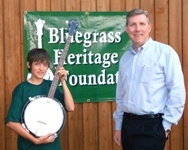 The Bluegrass Heritage Foundation, as part of a continuing effort to encourage young people to learn to play bluegrass music, provided scholarship assistance to 11-year-old Liam Purcell so that he could attend a day of the Smoky Mountain Banjo Academy this past weekend. Liam was thrilled to meet many of his banjo heroes, including Mr. J. D. Crowe, winner of the Foundation’s Bluegrass Star Award® in 2011. 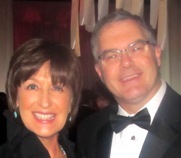 The scholarship to Liam was part of the Foundation’s Play It Forward!™ program. The program helps foster music literacy and performance skills in deserving young people (ages 8-21) by providing free access to the primary bluegrass musical instruments, including mandolins, guitars, banjos, and fiddles. Several dozen instruments are in presently in circulation as a result of the program. See more on this story at BluegrassToday.com. The Bluegrass Heritage Foundation today accepted another donation for th e support of the Play It Forward!™ Instrument Lending Program from Mr. and Mrs. Lamar Hunt, Jr. of Kansas City, Missouri. Mr. Hunt is the eldest son of the late sports magnate Mr. Lamar Hunt, founder of the American Football League and the Kansas City Chiefs (a National Football League member team). Mr. Hunt’s family presently operates the Kansas City Chiefs as well as FC Dallas and the Columbus Crew, member franchises of Major League Soccer. Mr. Hunt is the founder of Loretto Properties, LLC, a residential real estate firm based in Kansas City, Kansas, and Loretto Charities, LLC, a philanthropic organization. Mr. Hunt is a dedicated father of seven children, is the grandfather of three grandchildren, and has had a lifetime affection for music. He played the flute for nine seasons as a member of the Kansas City Symphony and continues to blog about their performances on a regular basis. He also writes about sports topics, which include professional football and soccer. The Bluegrass Heritage Foundation has recently presented full-size fiddles to Miss Katherine Raper of Trophy Club, Texas and Mr. Chad Bekarian of Dallas through the Play It Forward!™ Instrument Lending Program. 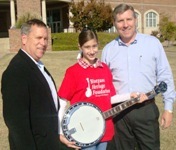 The Foundation also recently placed an Alvarez 5-string banjo with Miss Katherine Flink of Richardson, Texas. We are thrilled that more young people are getting the opportunity to grow and advance by playing bluegrass music. We appreciate all who have generously supported Foundation so that these young people have the opportunity to learn to play. In early September, guitarist Lucas White (who appears in the Bluegrass Heritage Foundation short film, Fanning the Fire, and tours with the Zac Brown Band) approached us about helping North Carolina banjo phenom Brandy Miller to get a professional-grade banjo through our Play It Forward!™ program. Brandy is a wonderful young person who has been competing in banjo contests since age 9 and who won the Galax, Virgina banjo championship this year – at age 14. We told Lucas that the Foundation did not have money for such a purchase but, after finding out more a bout Brandy, we challenged him to make a donation to make something happen for her. Well, he stepped up, and his donation was matched by another Foundation donor. Those donations and some Play It Forward! program money was enough to reach the goal. We contacted Steve Huber of the Huber Banjo Company and he quickly agreed to provide a professional-grade banjo for Brandy at a reduced price. We presented the new Huber banjo to Brandy at IBMA’s World of Bluegrass in Nashville on September 28, 2012, and she was thrilled beyond words. She played her new banjo at several showcase events, including the Kids on Bluegrass show. Read all about it in the great story by John Lawless, Jr. in BluegrassToday.com. Photo credit to Dan Loftin and video production credit to David Seay Productions. Your support of the Foundation made it possible for a very talented young musician to have a professional banjo with which she can continue to learn, play, and compete. Congratulations, thanks for your support, and enjoy some banjo music by Brandy Miller! The Bluegrass Heritage Foundation today presented a 1/4-size fiddle to young Miss Leise Johnson of Dallas, Texas through the Play It Forward!™ Instrument Lending Program. 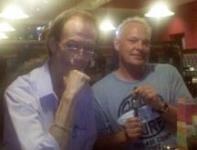 The Foundation also recently placed a new Recording King 000-size guitar with young Mr. Mark Harz of Amarillo Texas. 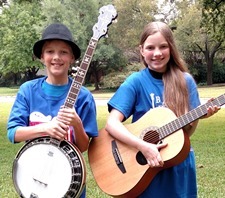 And Parker and Brody Genzel of Anna, Texas, along with their bandmate Jonathan Smith of Anna, have formed a new youth bluegrass band known as the Bluegrass Brothers – and all three are playing instruments loaned to them under the Foundation’s Play It Forward!™ Instrument Lending Program! We couldn’t be more excited that so many young people are getting to grow and advance by playing bluegrass music. We appreciate all who have generously supported Foundation so that these young people have the opportunity to learn to play. The Rices encourage friends and fans to support the Bluegrass Heritage Foundation by ordering a DVD of Fanning the Fire, a new short film that explores the uniquely American musical form of bluegrass and its broad appeal to beginning players and professionals alike. The DVD is available for a minimum donation of $15 per copy to the Foundation and may be ordered at the Foundation’s website, BluegrassHeritage.org. Bluegrass Heritage Foundation President Alan Tompkins and board member Charlie Seraphin presented Josie Taylor of Flint, Texas with a Fender five-string banjo today as part of the Foundation’s Play It Forward!™ bluegrass music Instrument Lending Program. Josie has already started banjo lessons and is excited about learning to play bluegrass music. The Play It Forward!™ Free Instrument Lending Program is generously supported by Pizza Hut, Inc. Play It Forward! program participants Lizzie and Charlotte Benedict of Dallas, along with Alan Tompkins of the Bluegrass Heritage Foundation, talk with host Erin Harris of D/FW Closeup on KDAF CW33 (Oct. 10, 2010) about the Play It Forward! Free Instrument Lending Program and the upcoming Bloomin’ Bluegrass Festival in Farmers Branch, Texas. 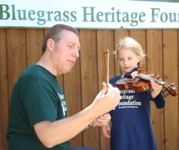 Bluegrass Heritage Foundation President Alan Tompkins presented Reagan Hunter of Plano, Texas, with a new fiddle as part of the Foundation’s Play It Forward! bluegrass music Instrument Lending Program. Reagan plans to begin fiddle lessons and is excited about learning to play bluegrass. Foundation President Alan Tompkins commented that “we are always happy to share the joy of music with another young person.” The Bluegrass Heritage Foundation Play It Forward! Instrument Lending Program is funded in part by Pizza Hut. Bluegrass Heritage Foundation President Alan Tompkins and board members Gerald Jones and Charlie Seraphin today presented an assortment of guitars, banjos, and mandolins to young people in north Texas through the Play It Forward! Instrument Lending Program. “We are excited that more young people will have the opportunity to play acoustic music,” said Tompkins. “We’re also pleased that we have now placed a total of 20 instruments under the program. We offer thanks to Pizza Hut and those who have donated so that these young people have the opportunity to experience the joy of music.” The Play It Forward! program is funded in part by Pizza Hut, Inc.
Bluegrass Heritage Foundation President Alan Tompkins and board member Gerald Jones presented the Fiddle & Pick Musical Heritage Center of Middle Tennessee with an assortment of fiddles as part of the Foundation’s Play It Forward! Instrument Lending Program. “We love what the Center is doing to help kids learn to play acoustic music,” said Tompkins. 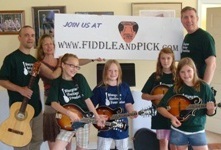 “We’re thrilled to have the opportunity to work with Fiddle & Pick to help these young people learn to play this incredible music.” Both the Foundation and the Musical Heritage Center work to share the joy of traditional acoustic music with the public. The Play It Forward! Instrument Lending Program is generously supported by Pizza Hut, Inc.
Bluegrass Heritage Foundation President Alan Tompkins presented the Benedict family of Dallas, Texas, with a new fiddle and mandolin today under the Foundation’s Play It Forward! Instrument Lending Program. The girls are already taking fiddle and mandolin lessons and are very interested in learning to play bluegrass. Their father, Keith Benedict, is a native of east Tennessee, is a longtime fan of bluegrass music, and is excited that his girls want to learn to play bluegrass music. 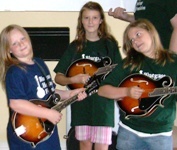 Tompkins commented that “we are thrilled that the girls have shown so much interest in the music.” The Play It Forward Program is a program of the Bluegrass Heritage Foundation and is supported in part by a donation from Pizza Hut, Inc. The placement is a perfect partnership for both organizations, whose missions are both built on the goal of sharing and promoting traditional music, like bluegrass, to the masses. 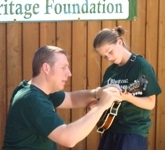 The Bluegrass Heritage Foundation is interested in receiving inquiries from young people in the Dallas/Fort Worth area who are interested in learning to play the mandolin, banjo, guitar, or other instruments traditionally used to create bluegrass music. The Play It Forward! Instrument Lending Program is generously supported by Pizza Hut, Inc.
Bluegrass Heritage Foundation President Alan Tompkins presented Ryan McKillip, age 14, of Carrollton, Texas, with a new banjo today under the Foundation’s Play It Forward! Instrument Lending Program. Ryan started playing guitar shortly before the 2008 Bluegrass Heritage Festival, and became very interested in playing more bluegrass after attending the Festival and its workshops. Ryan expressed his interest in learning to play banjo to his father, Ross McKillip, who approached the Foundation to find out more about the Play It Forward! program. Alan Tompkins commented that “we are pleased and excited to get this banjo into the hands of a young man who is so excited to play and learn more about bluegrass music.” The Play It Forward! Instrument Lending Program is funded in part by Pizza Hut.